Looking very black and white today! Think I might have subconciously been inspired by all the photocopied essays Ive been trudging through for uni today, yawn. New skirt which I picked up in Westfield last week, which was a bargain at around £20. I've been after a really nice paper-bag style skirt for a while now so I couldnt resist this one when I saw it. It came with a cute chain belt aswell, which saves me the hassle of accessorising (which I am RUBBISH at!) Really glad I got it actually because its come in seriously handy in all this hot weather malarky, worn it every day since! In my room it's really hard to get a decent photo, I have to balance my tiny rubbish camera on a stack of stuff to get it to a good height! I really wanted to show off my shoes but couldnt get them in properly. They're super-patent black brogues and are so quirky, I love them! They make me feel like I should be Frank Sinatra's best mate. Just as a bit of a general enquiry, I'm really interested to know what people would like to see more of on my blog. I enjoy posting all sorts but just wondering whether people prefer the outfit posts, product reviews or more personal entries I make? I've had a couple of emails asking for a post of my hair and makeup routines, but not sure whether this would appeal to people in general. I'm a bit wary of doing them incase people think I'm being all 'DIS IS HOW U LUK LYK ME OK'. Please let me know, it means a lot to me that anyone wants to follow me on here so I really want to make sure that what I post interests everyone! 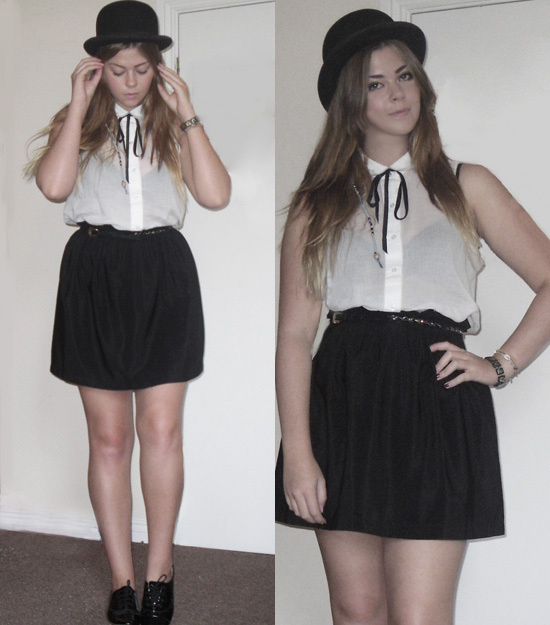 Love your bowler hat !! I would be interested in hair or make up posts ! Love this blog! Your funny and fashionable...what more could a blog reader need! I'd really like to see more posts about yourself (it's really nice to know the person behind the blog!) or make up/hair posts! loveloveloveLOVE this look, really gorgeous! !